Citation: C N Trueman "The Death of Guy Gibson"
Guy Gibson was one of Bomber Command’s most famous officers duringWorld War Two. Gibson was awarded theVictoria Cross for his leadership during the legendary Dambuster Raid of 1943. As follow-up Lancaster bombers from 617 Squadron approached their target, Gibson flew his Lancaster alongside them to effectively double-up the amount of fire from the aircrafts that could be aimed at German gun emplacements based on top of their targeted dam. Gibson was seen as too valuable in terms of his propaganda value to be allowed to fly after the raid. He toured America and Britain and was effectively retired from engaging the enemy by his superiors. After a great deal of pleading, Gibson was allowed to fly ‘in anger’ and on the return from one of his missions over Europe, Gibson’s Mosquitocrashed and Gibson and his navigator, Jim Warwick, were killed in September 1944. The official cause of the crash has always attracted a degree of scepticism among aviation historians. As no one could officially say what happened two theories were forwarded: the first was that Gibson ran out of fuel and crashed as a result. Critics of this cause countered it with their belief that Gibson was too skilled as a pilot to allow something so basic to bring him down. It was also said that if Gibson could fly a Lancaster bomber at such low heights as the Dambuster Raid required, he was certainly skilled enough to glide down a Mosquito to enable a decent crash landing even if he had run out of fuel. The second cause was that Gibson was flying his Mosquito very low, which he was certainly skilled enough to do, but was hit by enemy ground fire. However, in October 2011 a new cause was forwarded to explain Gibson’s death. Newly found evidence indicates very clearly that Gibson’s Mosquito was brought down by what is now termed ‘friendly fire’ – that a British bomber returning from a mission over Nazi Germany mistook the low-flying Mosquito as a Luftwaffe aircraft and shot at it accordingly. Sergeant Bernard McCormack, a gunner in a Lancaster bomber, believed that he mistook Gibson’s Mosquito for a Junkers-88. McCormack’s Lancaster was returning from a night time raid over Nazi Germany. Many bombers got lost or flew off course on the return leg of their flight to their British bases so all crew members would have been alert and possibly ‘trigger happy’ because of the very real threat of being attacked. Once McCormack became convinced that he had shot down Gibson’s Mosquito, he remained quiet. He died in 1992 but not before he recorded onto recording tape what he believed had happened. Official RAF reports on the crash stated that no other aircraft was in the vicinity of Gibson’s Mosquito when he crashed – hence the running out of fuel and being shot from the ground causes forwarded. However, the flight combat report of McCormack’s Lancaster clearly shows that he was in the vicinity of the area where Gibson would have been flying. It also states clearly that the crew shot at what they thought was a Junker -88. 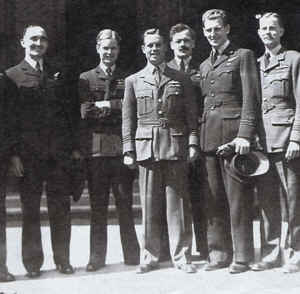 Another Lancaster crew flying in the same area as McCormack’s also noted in their combat report that they saw an aircraft flying out of control before crashing. They also saw red target indicator flares explode on the crashed aircraft and Gibson’s Mosquito had been carrying the very same flares – except that Gibson had radioed in that he could not use the ones he was carrying because of an equipment malfunction. However, they would have been on board his stricken Mosquito when it crashed and the impact and fire would have ignited them. Both Lancaster reports also stated that they were flying just three minutes flying time from Steenbergen in the Netherlands which is where Gibson crashed. Both combat reports were made classified by the RAF and have only recently been unearthed in the National Archives. In his tape recording, McCormack described the moment when he was questioned by a RAF Intelligence officer. “We were on the way back over Holland and then all of a sudden this kite comes right behind us twin engines and a single rudder – and it comes bouncing in towards us so we opened fire and we blew him up. “When we got back we claimed a Ju 88 show down. The following day we were called in to the office and we were quizzed again. If this was the case then it would be understandable why the RAF wanted such an incident covered up. Gibson was almost the perfect propaganda war hero. Just 26 years of age, Gibson has been awarded the VC, the DSO (and Bar) and the DFC (and Bar). Killed in action by the enemy might have been a more acceptable reason to explain away Gibson’s death and it would have fitted in with his hero status. However, killed by your own side would have been a propaganda disaster. Some still believe that Gibson crashed for other reasons. Gibson had a huge belief in his own ability to fly. He was undoubtedly a highly skilled Lancaster pilot. However, he never completed a course in how to fly a Mosquito, an aircraft that handled very differently to a Lancaster. The ‘Wooden Wonder’ was much faster, more agile and a completely different flying experience. Jim Warwick, his navigator, was also flying on a Mosquito for the first time. It would have been his job to check the fuel tanks and the level of fuel on board during the flight. Some still believe that Gibson’s Mosquito simply ran out of fuel or that it had a faulty fuel gauge on board which gave misleading readings. Bernard McCormack, however, clearly believed that it was the 600 rounds he fired at the ‘Junker-88’ that brought down the aircraft that he was later told was Gibson’s Mosquito.